Jenny Eclair is known for many things. Comedy aficionados know her as the first woman to win the legendary Perrier Award in 1995. Telly-watchers know her from assorted larks such as Loose Women, Celebrity Masterchef, and The Apprentice. Radio listeners have had her dulcet tones dipped in their ears from all angles, and the stage production of TV show Grumpy Old Women played to houses packed with cackling females all with one thing in common; they wished they’d brought spare knickers. Ok, Jen. Let’s get the important stuff out of the way. My editor told me not to mention my pants. What pants are you wearing? M & S, size 14, from a ten pound triple pack. White(ish) – proper stout walking pant. Thanks. Ok. Life, Death, and Vanilla Slices. You’re a Saturday girl in Waterstone’s. Sell it to me. When LDVS came out I was fighting against the tide of 50 Shades, which Waterstone’s were piling to the rafters – they didn’t have much room for anything else. Fortunately the reviews on Amazon have done most for sales and I’m incredibly grateful to everyone who’s bothered to do that. I love the title. Two massively serious things offset by something sweet. Was it always that title in your head or did you have others? The folder on my computer was titled ‘Sisters’. At one point we toyed with ‘Mothers and Sisters’. I also quite liked ‘Look Right, Look Left, Look Back’. I find titles a nightmare. The book seems to be peppered with little nods to real life, like the sons’s puke on the glass roof – do you get a mischievous glee from including real things? There’s a lot of real life in there, but novels create their own real life too. Many of the places are real, most of the incidents aren’t. Can fiction ever just be fiction, without our own lives peeking out from behind the characters’ furniture? I’m only halfway through, but I’ve got a terrible feeling it’s going to make me snot. What response would you most like from your readers, if not snot? There should be plenty of snot, I snotted three times when I did the audio record. My daughter howled when she finished it. I could hear her and I sat downstairs rocking with laughter. Do you go bonkers when writing your books, or do you enter a nice, reflective state? A mixture. Getting going is the hard part – it’s like walking up a really big hill. Once you’re halfway and you just have to walk down again it’s not so bad. In fact usually when you’re close to the end you don’t want to ever finish. Writing a book is pretty awesome. Did you ever think you would write three novels, you big brainbox? It was always something I wanted to do before I hit forty and I managed it – just. I’d written a comedy book in my thirties, ‘The Book of Bad Behaviour’, but I knew I wanted to write a proper book and there were other comics doing it who I didn’t believe cared about fiction as much as I do. I am a reader, I love books. It’s a massive relief to love books – it means you can never really be bored. Which book by another author would you love to have written? In some respects it would be great to do a Donna Tartt and write something like ‘The Secret History’ which everyone will admire forever, but I also think that that could cripple you creatively for years after. The other trick is to write the book that becomes the film. We all have that dream. God, yes. I’d steal The Secret History for myself too, if I could. In terms of your comedy, was it lonely being one of only a few successful women in the industry at the time of your Perrier award win, or did you secretly quite like it? Of course I secretly loved it, but I did feel under enormous pressure too and spent a lot of time crying in corners and feeling guilty. Typical female response to even a tiny bit of success. How do you think we might best go about putting the ‘Are Women Funny’ debate to bed? Can we; should we? I think it’s still an important question. I’m bored of the chit-chat around it, but I do think it’s a fascinating debate. Once upon a time there was such an incredible imbalance. It’s changing, and it must be changing for a reason, and those reasons are socially interesting. Because of my age and experience, dismissing the question’s existence makes me cross – it was quite tough thirty years ago and without harping on about it, I think everyone needs to acknowledge this fact. Amen, sister. *Clicks fingers sassily* Do you remember ever having a fork in your life where you might have chosen something else? No, I knew I was going to be a performer – I just didn’t know stand-up existed for girls (I was born in 1960). I thought I would have to be an actress. It’s a good job stand-up did exist – I wasn’t a very successful actress, though I still like to dabble. If you could only have achieved one of your successes, which would it be? Apart from Phoebe, it would be the ‘Grumpy Old Women Live’ shows – hearing so many women laugh in the same space. 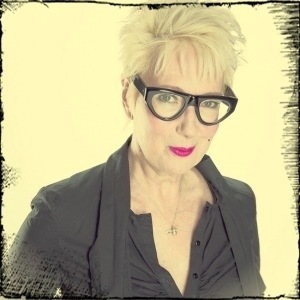 What is the most un-Jenny Eclair thing that you would secretly like to do? Learn about wildlife. I like flowers and birds but don’t tell anyone. It’s time I was an expert in something; I’m a grown up but I have no adult skills. Ok. Some quickies: What makes you maddest/saddest/baddest? Which person in history would you most like to punch in the face? What is one of your happiest memories of being a kid? Kiss chase in the playground. Oh, the terrible excitement! You can keep only three things in your house. What are they? My computer, my stand up gig bag, and a framed picture of Geoff and I when we were young. What is the most ridiculous thing you have ever done? You’re on your deathbed. You’ve got a bit of time to wheeze out some considered last words. What are they? Why have you brought me to Switzerland?